Do you often wonder if your style of shoe matches your favourite pair of blue jeans? Here, we give you the low down on what type of shoe you should, and more importantly, shouldn't be wearing with your trusty denim trousers. Picking the right shoes to wear with jeans can be a hard task. There are many colours and cuts of jeans out there, and there are even more styles of shoe to choose from - so we understand it can be a bit confusing to know whether you are looking your best or not. But, look no further and worry no more. We have all the info you need to know about what goes well with what. 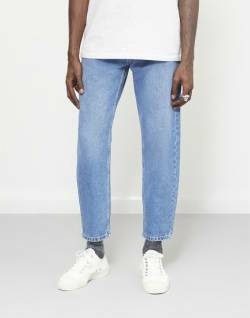 Good news, guys, jeans are a very versatile item of clothing, which is brilliant for those lazy few men out there who hate going shopping, or who don't want to worry too much about having to put together outfit combos. This means that a good pair of jeans can be worn on many occasions, with many different pairs of shoes. On first thought, most men might automatically put jeans with trainers. However, this is not always necessarily the case. 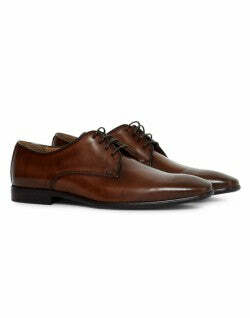 Dress shoes are often worn with jeans for a modern, smart casual vibe. There are just a few rules to consider. Follow this trio of things to think about and you will be all set. Choose a dressier style of jean - distressed jeans or jeans full of rips and holes will clash with your dress shoes. Make sure that you turn up the bottom of your jeans, or wear skinny jeans, as they will not cover the dress shoe, and this will leave you with just a pointy toe end creeping out - not attractive. Don't pick a dress shoe that is too dressy - contradictory, we know but it does make sense. This is so it balances out the casualness of jeans and the formality of dress shoes, making the whole outfit combination work together. Balance out the rest of your outfit in the same way - wear a smart jacket or blazer and a shirt, but maybe with no tie and a few open buttons, to keep the smart casual feel flowing. Since the main focus of this guide is to inform you on what shoes you should be wearing with blue jeans, here are some blue hue colour combinations for you to use as inspiration. Blue jeans are the most famous colour of jeans and are exceptionally versatile. Nothing really looks bad with blue jeans which is an added bonus, however, it's recommended that you stick to the same tones to avoid any overwhelming clashing outfits. Very pale blue jeans are excellent for spring or summer. 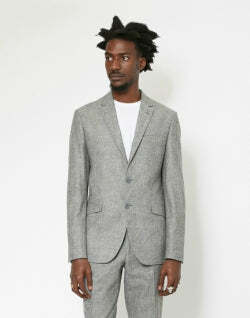 Worn with white, you're outfit will look clean cut and smooth. Light blue jeans are good for summer and especially good for a holiday. This is because they do not attract the heat as much as darker jeans do, so they won't make you as unbearably overheated when you're out for evening meals etc. Wear with a colourful shirt and a pair of flip-flops, slides or white trainers for the ultimate holiday vibe. Dark blue jeans go well with white - a simple white T-shirt or jumper will work a treat. Blue jeans and trainers go together like tea and biscuits. It's a combination that hasn't gone out of style for over 50 years and it's easy to see why. 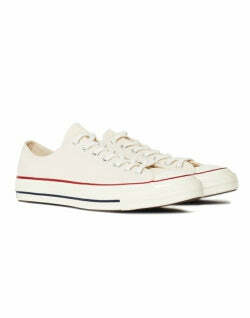 Adding a casual edge to your outfit by pairing your jeans with a pair of Converse or Vans is simple yet effective. Naturally, white and paler coloured shoes get dirtier faster, so even though they may start off looking fresher than ever, in the beginning, avoid them if you know you can get yourself in a bit of a mess. If you know you're messy but still want to pull off the white trainer look, invest in some shoe cleaning products which will protect them from getting too dirty. As you can see in the outfit below, Converse add a classic edge to almost any outfit, bringing the whole ensemble together. Our own range of chore jackets are the perfect item for this years SS18. 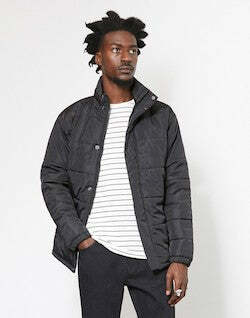 Paired with The Idle Man denim and you've got a really strong look that will last you for the whole season. When added to a pair of blue jeans, trainers add a casual edge, and wearing them with boat shoes gives off a chilled, relaxed, no worries energy. The blue jeans and a pair of boat shoes combination create a good look during the summer or on holiday, especially with a rolled up jeans hem. This means you have plenty of options available to suit any occasion and anything the weather may throw at you. Maybe you're wondering what raw denim is exactly? Well, to put it simply, raw denim is a denim pair of jeans that have undergone none of the typical distressing and washing processes like other regular jeans have. Raw denim is also sometimes known as dry or unwashed denim because of this. As the pair of jeans come straight off the loom with no other treatments before they are cut and sewn, they come off in a deep blue colour, with a distinctive sheen. To complement the deep blue colour of the jeans, either wear shoes in a contrasting pale colour such as white or wear something on the opposite end of the colour spectrum, such as a dark brown. The outfit below is a perfect example of how to style your raw hem jeans. 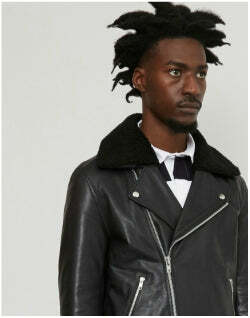 Classic pieces like a biker jacket are timeless and carry this style really well. 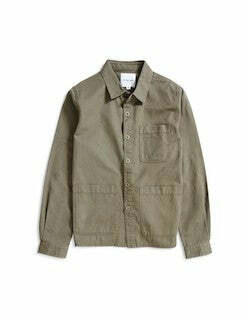 Paired with a simple open button shirt and a pair of Grenson boots, you've got a real heritage look going on here. 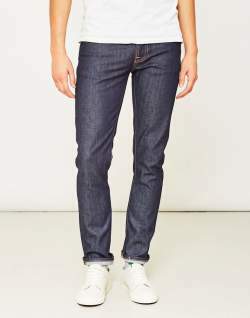 Skinny or slim-fit jeans are possibly the most popular men's (and women's) style of jeans out there on the market right now. They can be dressed up or down and work well for both the day and for the night time. They are increasingly worn with Dr Martens as an aspect of an edgy outfit. Trainers look cool with skinny jeans too for a sports luxe feel. Confused about what to wear with your light blue jeans outfit? In the spring and summer months, look fresh by wearing crisp cool tones such as whites, creams, tans, and blues. These shades can be found again, in flip flops, boat shoes and even in a pair of formal tan dress shoes. Plimsolls are also a good alternative to wear instead of trainers as they're more lightweight - perfect for hotter weather as they'll not cause you any awkward sweaty feet situations and therefore prevent the nastiness that comes along with all that. When wearing dress shoes make sure you're in either skinny or slim jeans as this will even out the outfit. With trainers and jeans pretty much anything goes, however, we recommend that you stick to white to make your outfit look a lot cleaner. Boots should have your jeans sitting just on top of your boots, but not with too much excess fabric, to show off the jeans and the boots at the same time. Loafers will add that smart and casual look making them perfect for that night out or the office. As you can see from our handy little guide, your options on shoes with blue jeans are pretty much wide open. It's important to remember that your shoes should compliment your blue jeans. Be brave and daring, but don't cross into the realm of stupidity just to make a statement. 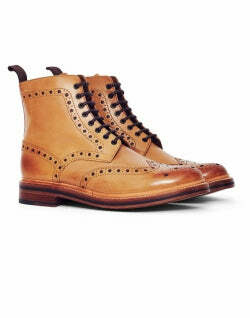 From trainers to tasselled loafers and brogues to boots, your shoe choice is wide open.